Remember the blog post that went up on March 9th, 2019 entitled Afraid to Progress? It recapped the story of an agility dog that came to me after 5 months of being in hobbles for a left shoulder instability issue. Essentially, the dog’s vet and the animal chiropractor that had been managing the case were unsure of how to progress and/or simply weren’t challenging the dog (and the tissues) in order to improve the status quo. Well, I’m happy to report that the dog in question returned for a check-up this week and things are looking good!! Now, a full month after the first appointment, this dog has returned. Over the month, the owner has been doing walks and trotting off leash out of hobbles. Home exercises have included active shoulder extension (rear legs elevated and taking a cookie under the chest / between the elbows), 3-leg stands – progressing to diagonal-leg stands, push-ups, side stepping, tug of war, and balancing on inflatables. The owner was shown how to ‘wobble’ the shoulder joint as a simple shoulder mobilization. She was also instructed to use a tensor bandage (aka ace bandage) to recreate the hobbles, but in an elastic form, which would help with proprioception but not rigid support and movement restriction. This was to be worn when starting to practice easy pieces of agility equipment (i.e. tunnels, or low jumps). 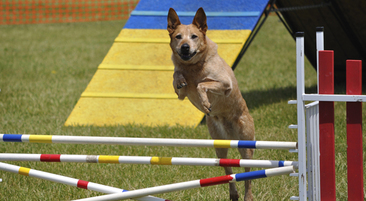 As you might expect, as an agility person… she pushed her dog and allowed him to do more than what was prescribed. (You know, perhaps we should not be surprised by this. It seems to be a common occurrence in the sporting world. So instead of being exasperated by it, perhaps give your owners the tools to know when something is too much. – i.e. the dog should not be significantly ‘lamer’ the evening or day after the exercise session. If he/she is, then you have pushed it too far. A mild increase might be okay… but you’ll have to decide what you tell the owner based on what the pathology is. – tendon, OA, post-op, etc. will all have different thresholds of acceptable increases in soreness after an exercise bout.) In this case, over the month the owner had also allowed some agility training (in her house, not on a full agility course) without the elastic bandage. She was now wondering about allowing off-leash romps in a wooded area with her other dog, and when she could actually start agility re-training again. Before I could answer that question, I had to evaluate the dog. I checked general ROM and abduction of the shoulder, soft tissue tenderness, muscle tone & bulk as well as spine, ribs, and pelvis and other extremity joints. The dog had an SIJ dysfunction and some lumbar spine pain on palpation, there was apprehension with shoulder abduction (bilaterally), and mild soft crepitus on the left, but much less pronounced than last month. As well, the muscle bulk was actually a bit diminished on the right pectoral as compared to the left. The owner had stated that she had always thought that his issues in the past had been right front and that it was just the incident 6 months ago where they saw a left sided lameness. She figured the right-side issue had caused a compensation that ended up compromising the left side. (And I would concur that this made sense.) The shoulder in question had full flex & extension ROM, and no soft tissue tenderness. All in all, a pretty good check up! Some thoughts about these findings: I think that many, many, many agility dogs have or develop medial shoulder hypermobility over their careers. Those that have had any issues or pain involved will be apprehensive with shoulder abduction over time. I have come to accept it as not only allowable, but a sign of joint awareness. So, with this fabulous check-up, I gave the owner my blessings to allow walking romps in the woods with his housemate and to start re-training agility. I gave the caveat I described above as a way to know if she has done too much with him. In regards to re-engaging in agility, my only advice is to not push the dog do a tight wrap around (i.e. jump the jump and then wrap tightly around the jump standard to come back in the direction from where it came). I said, this is hard on the shoulder(s). Interestingly, the owner had said that this was an area that the dog had always struggled with... (which would make sense if he had always had some medial shoulder hypermobility issues, albeit on the right side.) I told her, “Well, then, never push the issue. Perhaps he knows his body better than we think and he’s been doing the job in a way that preserves his shoulder(s) all along!” Isn’t that food for thought!!! What’s next? Well, she’s going to register him to compete in Regionals in June and work up to it between now and then. (She knows that if he regresses or isn’t keeping up that she can pull him from the trial, but she needs to register by the middle of April!) She’s got my e-mail and my number if she needs them. I’ll get to see him about a week before the Regionals for a checkup and tune-up. I am sure he’ll do well, and I’m tickled pink with his progress to date! There you go! I hope you can glean some thought processing from this story and update, and that it will give you some direction should you have a similar case come through your doors.